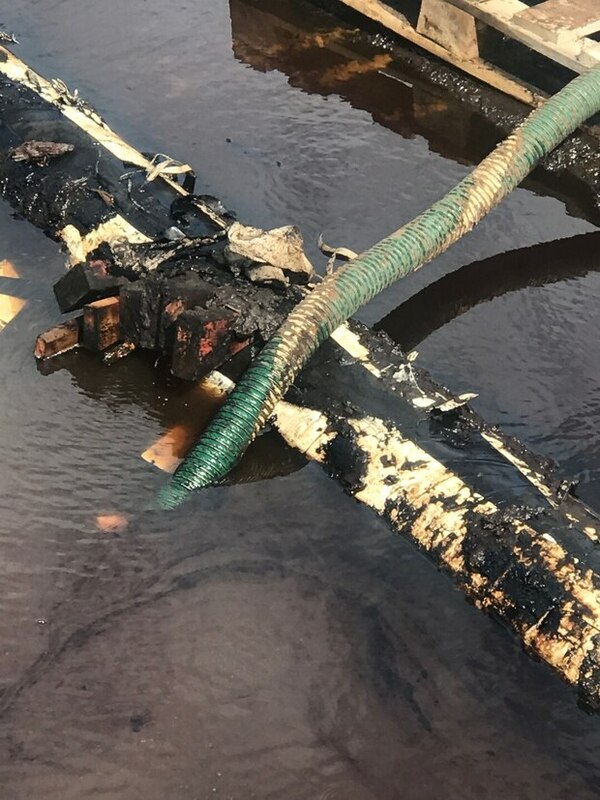 When the pipeline burst on Thursday, the response has included finding out how the damage had been caused. Tourism companies are already fielding calls from worried travellers after 27 flights were cancelled yesterday due to the “embarrassing” fuel crisis gripping Auckland Airport. The oil pipeline from Marsden Point burst on Thursday after it had been previously damaged by a digger trying to extract kauri logs near Ruakaka. The Government has offered to help oil companies struggling with an aviation fuel crisis that threatens to disrupt air travel out of Auckland for up to two weeks. All flights coming into Auckland have been advised to carry enough extra fuel to get out again. Long-haul flights are being redirected to refuelling stops at other NZ or international airports as oil companies predict it could take 10 to 14 days to restore normal supplies. Brent Thomas, House of Travel’s commercial director said staff were already handling calls from worried clients. “It’s an unusual situation – I’ve never seen anything like it in my time in the industry,” said Thomas who has been in travel for the past 20 years. He said travel insurance would typically cover a ”reasonable” cost of disruption from an event such as the fuel problem but every case was different. Last night the mood ranged from bemused to angry as passengers at Auckland Airport got varying degrees of help from their airlines. Some passengers faced unplanned stop-offs to refuel at Sydney or Christchurch, the delay meaning they were likely to miss connecting flights elsewhere. Others would have to wait days to catch their next flight, with no accommodation or transport help and only a voucher for the airport food court to show for their troubles. Most passengers had to find out through news reports about the fuel leak. No one had had a clear explanation of what had gone wrong or who was at fault, and it seemed some airline staff did not know either. Air New Zealand warned five years ago in a submission that a hit to the Marsden Point to Wiri pipeline could be a weak link, voicing concerns about the security of aviation fuel supply. Today it expressed “extreme disappointment” at the failure of the pipeline which came to light over the weekend. In a submission to a government review of New Zealand’s oil security in 2012, the airline said a material disruption would result in a serious situation with implications for the aviation industry operating to and from this country and to the economy. Pipeline owner Refining NZ has assessed the material impact on its revenue will be in the order of $10 million to $15m. It could be next week before the leak, near the Marsden Point Oil Refinery, is repaired. In its submission Air New Zealand said the volume of fuel that could be stored near the airport needed to be reviewed. In 2012 about 1.1 billion litres of aviation fuel a year was used at Auckland Airport and since then flying has increased substantially. Air New Zealand warned that a global supply shock would be understood and accepted by the travelling public. “They will not however uncritically accept a fuel supply shock that occurs solely within New Zealand,” said the submission signed by chief financial officer Rob McDonald. The submission said package tourism depended on certainty. In its latest update today the airline said about 2000 of its passengers would be affected by flight cancellations. 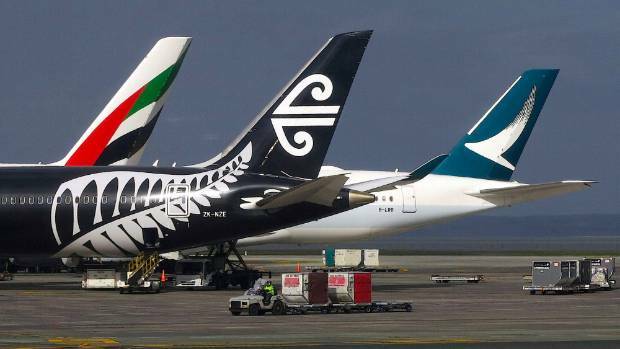 All 28 airlines that use Auckland Airport are affected as the pipeline shutdown meant only 30 per cent of usual fuel supply was available. In addition to the cancellations, some long-haul services to and from Asia and North America will undertake refuelling stops at selected Pacific or Australian airports. To date, three North America services have refuelled in Nadi, Fiji. Today, flight NZ99 from Auckland to Narita, Tokyo will make a refuelling stop in Brisbane. The airline is also ensuring domestic jet services uplift maximum fuel limits when operating out of Wellington or Christchurch to limit refuelling in Auckland. Air New Zealand chief operations integrity and standards officer Captain David Morgan today said the refuelling stops completed overnight went well and the practice will continue to alleviate pressure on fuel supplies in Auckland. “Aviation is a critical transport industry and the lifeblood for tourism and we are naturally extremely disappointed with this infrastructure failure,” Morgan said. Based on information available at this stage, Air New Zealand believes the fuel supply issue was unlikely to have a material impact on its result for the current financial year. Whatever way you slice it and dice it this is embarrassing and does our international reputation no favours what soever. 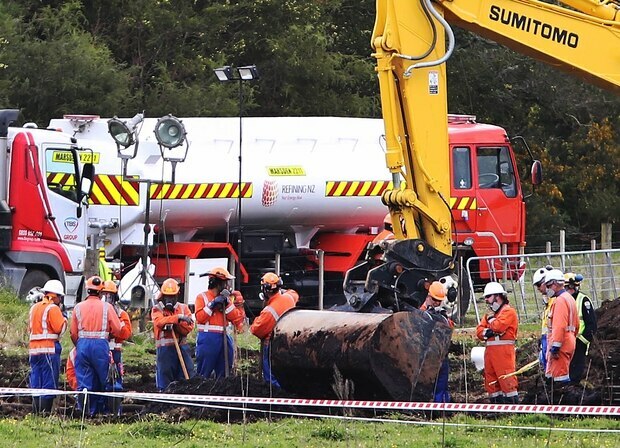 Whether some digger searching for Kauri whacked the fuel pipeline or not is beside the point. The point being is that New Zealand has woeful redundancy capacity – ironically outside of the rail network. Who should be portioned with the blame on the fuel pipeline saga? Well first fears of such a situation were raised in 2005 however, sole blame lays with the current administration given it has had nine years (to borrow their term) to fix the problem. Source for last two figures come from Wiri Oil Services Limited. So apparently it has been known for a while that the pipeline like the National Grid (electricity) had vulnerable due to the stringy nature and no back up supply. The naval tanker is being brought in to move fuel from Marsden Point to the rest of the country. This is a right old crisis. Essentially what you have is a bi-directional circuit giving best redundancy we can without sending tanker trains down the Northern Auckland Line, Southern Line and the North Island Main Trunk Line to either Wiri (that would need an oil station) or Hamilton. That said having tanker trains around would be prudent as well. Source: David Gray/STUFF Long haul flights require so much fuel that the Government has been told attempting to truck aviation fuel to the airport would have a “negligible” impact on supplies at Auckland Airport. 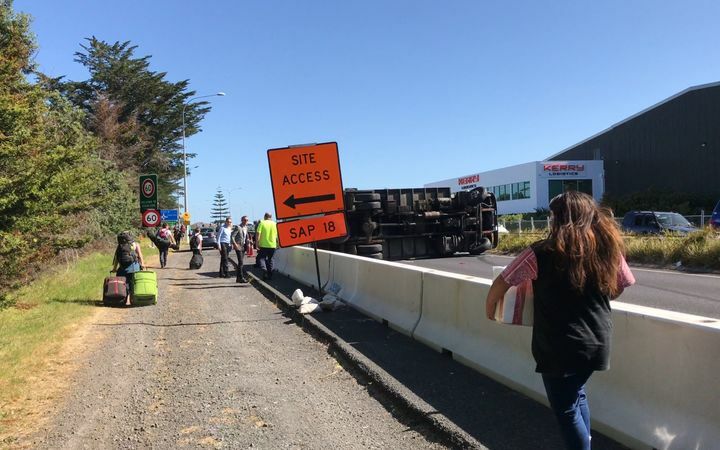 Up to 20 military fuel tanker drivers will join efforts to keep petrol flowing into Auckland, although the disruption to flights is set to continue. On Monday afternoon Energy and Resources Minister Judith Collins said the drivers would “assist local operators in managing their increased workload”. Separately, the Defence Force had offered to use the naval tanker HMNZS Endeavour to move diesel fuel from Marsden Point to other parts of the country, while a “major exercise” with Singapore had been cancelled to “preserve fuel”. On Sunday it emerged that the fuel pipeline which supplies virtually all of Auckland’s fuel had been cut, forcing aviation fuel to be rationed and stretching supplies of petrol and diesel. * What are your rights if your flight is cancelled? While Collins says it appears the efforts appeared to be doing enough to keep Auckland with enough fuel for ground services, there was little that could be done about disruption to Auckland Airport until the pipeline was repaired. Collins said she had asked the industry whether there was any option to reduce disruption at Auckland Airport by trucking in aviation fuel. “The answer given to me by the refinery is that [the impact] would be negligible, given the volume required for any plane,” Collins said. This is the price of National thumb twiddling resulting in no redundancy capacity. As Petrol Stations Run Out of Petrol Could Rail Provide an Answer?